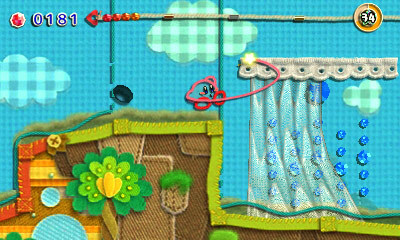 The original Kirby’s Epic Yarn was on the Wii and it was an adorable, memorable platformer that was actually underrated at the time. Luckily, it now has a 3DS version which not contains the original game, but also a few extra bells and whistles. But is it enough to get gamers to pick up a second time? The new features include two mini-games including Meta-Knight and King Dedede, as well as a Devilish difficulty mode, new abilities, Amiibo and Streetpass support. There’s no 3D support, which is to be expected at this point…but it is still a little disappointing, I would have really enjoyed seeing the game with it. The game doesn’t handle like a typical Kirby game as you can’t inhale and copy abilities, since Kirby is made of yarn…but he can use his yarn tongue to pick up and throw objects and enemies, as well as pull on strings and even transform into yarn versions and other vehicles. It doesn’t pose much challenge on Normal, but the new Devilish mode will definitely take some doing. As with the original, there are treasures scattered through the levels and some that can be planted in your apartment to decorate it. You can also buy designs using the beads you collect, it’s all purely cosmetic but a nice touch. The 3DS pulls off a brilliant visual port of the original, running at a smooth framerate and with minimal load times between levels. The music is typical of the Kirby series and charming in its own right. The art style is brilliant and adorable, you’d literally have to be made of stone not to gush a little at how cute it is. 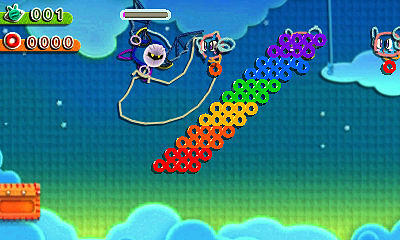 Kirby’s Extra Epic Yarn is a decent remake of the original with some extra content thrown in for good measure. It would have been nice to have 3D support, but that aside it’s a brilliant port and one worthy of newcomers. It’s hard to say if there’s enough new here to warrant a second buy for those who have the original, but the new Devilish mode and mini-games should keep you busy regardless.